Recently my family was discussing the working of patents at the kitchen table. Patents on ideas and objects made are to protect them from being used, copied or changed by others without you wanting or knowing. Besides, it’s your idea after all and people should pay you as the super smart inventor. When I entered the discussion trying to explain the benefits of using GPL, my status as ‘Linux Freak‘ was acknowledged. So far. Next time I’d better use the LEGO metaphor. Every weekend we lay on the floor building whatever comes to mind with LEGO. 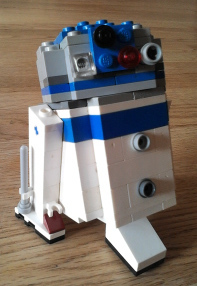 With over 40 years collecting we not only have a huge stack of pieces, but also I have a very rich experience in inventing and building vehicles, airplanes and even my own version of an R2D2 with rotating head and adjustable legs. use parts of the <device_name> to fit to their inventions. Being Open Source minded I like them using my invention to accumulate with theirs. Most of my LEGO builds are instantly GPL-led. But what happens when I just say ‘No‘ to them changing the order, form or colour of my buildings blocks and ripping off any modules? Well, they quit playing with me because in their opinion I don’t foster their creativity. And they are right indeed. Now the link to Open Source software, city planning, […] and education is obvious. We need to share to make things greater and with better fit for whatever human need. Not only in coding, but also in organizing things, building houses and in a spiritual sense. Thesis – Antithesis – Synthesis is practised with enough eyeballs makes things grow faster, with better fit and chase bugs away easier. Besides: we wouldn’t be able to travel though time if Einstein kept his Theory of Relativity all to himself. But how do we convince our junior citizens and beginning coders to share their ideas or code and have them mix and accumulate with the inventions of others? By just playing with them and sharing the mindset of the GPL. This entry was posted on 3 June 2014 at 22:16 and is filed under Coding, IMHO, Linux. You can follow any responses to this entry through the RSS 2.0 feed. You can leave a response, or trackback from your own site. glad to hear you like my postings! I surely keep up the writing as I enjoy it very much.